That’s what the Afghan burqa, or chadri, has become—a fetishised symbol to mock Muslims. Imagine a politician walking into the Australian parliament dressed up in a nun’s habit, or wearing sidelocks and a felt hat, or in blackface wearing a loincloth and tribal body paint. When these items of religious and cultural dress—almost inevitably cheap, counterfeit versions—are donned by non-adherent members of the dominant racial group their meanings are spoiled and transformed into stigma symbols. Stripped of their natural context, they become emblems that mark a minority group as being worthy of ostracism, disgust, pity, and ridicule. Muslim veiling practices have long been the subject of Western fascination and loathing even before colonialists dominated Oriental lands. Nineteenth-century French photographers in Algeria hired women, most likely prostitutes, to attend their studios and dress up in traditional face-veils, jewellery and dresses, but with their breasts exposed. The postcards were then sold to other Westerners in what was a very lucrative business. They were an artificial construction reflecting the imagination of the colonialists, as were the harem paintings of Jean Auguste Dominique Ingres, who never even set foot in the Middle East, or Hollywood’s chiffon-veiled belly-dancers of the studio era. Ironically, vast numbers of Muslims were initially keen to embrace Westernisation in the first half of the twentieth century. As a growing middle-class emerged, women and men adopted the French and British modes of dressing. Men put away their turbans and cloaks, shaved their beards, and put on suits. Women took off their headcovers and face-veils and wore skirts and blouses along with fashionable hairstyles. People in black and white photographs of mid-twentieth-century Cairo, Tehran, Kabul or Istanbul wouldn’t be out of place in London, Paris, New York or Sydney. Iran and Turkey even banned traditional dress for both men and women, with Iran’s Reza Shah proclaiming: 'Westerners now wouldn’t laugh at us' and ordered men to wear bowler hats. But as disenchantment grew with forced Westernisation and secularisation, both at the hands of dictatorial Muslim rulers, as well as meddling by foreign powers, a re-veiling movement emerged in protest. The growth of religious fundamentalism spurred re-adoption of headcovers and face-veils, particularly as women became the contested battleground. Veiling was no longer simply a traditional religious practice that varied in style from culture to culture, but a symbol of resistance. "There are many different types of Muslim female dress just as there are many different types of Christian religious items of clothing, that all carry different meanings and symbols for their wearers." But fundamentalism is a sterile spirituality, unsatisfactory to the majority who are not fueled by anger and angst. Today, many Muslims wish neither to reject their religious heritage, nor are they bound up in a myopic, apocalyptic vision of hate as spewed out by ISIS. They seek a middle way between respecting the basic requirements of their faith—including modest dress for women and men, however individually interpreted—and living in the twenty-first century with all the challenges and opportunities that brings. They are the ones who will turn up to an interfaith dinner wearing a long dress and headscarf and sit next to a Jewish female rabbi and share stories about balancing work and family life. Or, they are the ones who will outperform their male peers in engineering exams, whilst looking forward to marrying an arranged mate chosen by their families. They are even the ones that hold down jobs as doctors, physical therapists, computer programmers and pharmacists whilst covering their faces in front of unrelated men. So, there is not just one Muslim veil, the fetishised and feared burqa. There are many different types of Muslim female dress just as there are many different types of Christian religious items of clothing, that all carry different meanings and symbols for their wearers. Just as Christian women might wear a full habit if they are cloistered nuns, simple baptismal crosses if they are Baptist laywomen, or white kerchiefs and long dresses if they belong to a plain church, Australian Muslim women likewise run the gamut from bare-headed to fully-veiled. What they all expect and deserve is the freedom to peacefully practice their religion—and basic decency and respect from their political representatives. Hope you have sent Pauline a copy of this account, Rachel. Not sure it will change her views, however, because I think you may have used too many multi-syllable words for her understanding. "Please explain"! I hope Islamic people will see Hanson's stunt for what it is - a grab for attention by someone suffering from relevance deprivation - and not think it represents the views of more than the few people who support her. It was simply all about her and, while being covered in a burqa, she totally exposed herself and what she stands for. Her record speaks for itself and the best thing we can do in response is call her rubbish for what it is. Just why women's clothing holds such interest and passion for some (or many) people is perplexing. If a woman wears revealing clothing she is categorised, if a woman wears religious garb she is categorised and if a woman shows not much interest in her appearance she is also categorised. Can not win! I thought Pauline Hanson's stunt, for want of a better word, was truly disgraceful. And it reinforced the notion that we think differently about male and female attire. The question is not where Pauline Hanson obtained her burqa. It doesn't matter. 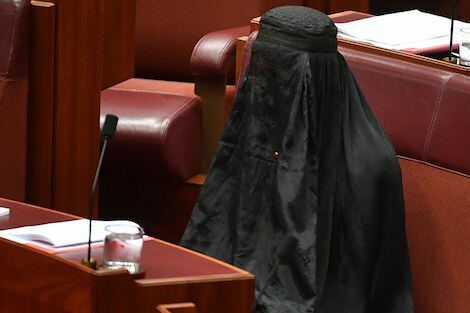 She obviously donned it in Parliament House and wore it into the Senate accompanied by a colleague so Security didn't question or stop her. It was a publicity stunt primarily aimed at her her voters and those who may be persuaded to vote for her. These are now convinced, assisted by the recent bombings in Barcelona, that the 'Muslim threat' to the West is real if they ever had the slightest doubt. The threat from Isis affiliated units or lone wolf actors in the West has indeed worsened since that organisation lost ground in both Syria and Iraq. I am unsure how many people in this country will read your article. Sadly, far more are likely to have listened to the exchange she had with Andrew Bolt she had on the matter or read his article. That is what is really influencing general public opinion. Personally I was disappointed when our religious stopped wearing the habit, even a healthier modified version, sometimes now not even wearing the cross of their congregation. They stood for selfless dedication to their Lord and Church, and at the least a proud example of Christian living in the modern world. I live in an area where you see every version of Muslim veiling, At one point Archbishop Hart suggested we should greet Muslim women to show support for them. I thought this a good idea and tried it. I found I made connection and received a smile no matter how covered up the woman. The real fear is of the unknown. That's way it is good to get to know all sorts of people. Sorry, I really meant I have not seen the chador, the black veil, worn here either. “probably a prostitute”, “looking forward to marrying an arranged mate chosen by their families”, “covering their faces in front of unrelated men” - can you not see the assumptions and prejudice against the freedom of women, compared with the freedom of men. Covering anyone’s face de-humanises that person. If men had to accept a chosen bride, if men covered their faces in front of women, then yes I could understand what you are saying. But I see a double standard. A religious friend when asked what difference giving up the habit made, she said very freeing. The freedom was physical of course but also mental. These garments are a way of restricting the movements of only one gender. They are garments of control. Until the wider population sees them for the repression that they are, instead of a patronising quaint custom, when men wear such restrictive garments and are not allowed to drive cars or see a female doctor, then I’ll have little more sympathy for this control and repression of women. Thank you Rachel for your brief but comprehensive history of wearing the veil, in all its forms, in Muslim countries during the 20th century. I witnessed the change in Indonesia from the early 1970s to the mid 1990s, when mainly young women started wearing the hijab, despite their mothers' preference for traditional Indonesian sarung and kebaya or western clothing. Friends described the change as expressing "my independence as a Muslim woman". Tragically, Pauline Hanson and those who support her are unlikely to read your article. Many people need a generation or two to grow into accepting social change. Hopefully Muslim Australians can weather the rough waters. There are a number if issues that are not discussed, Rachel, which I suppose are to do with potential conflicts of "rights" (though a much abused concept): 1. to what extent is the wearing of "religious/cultural"garb truly voluntary and how much due to frank or subtle coercion? ; 2. I feel I have the right to see the face of all my fellow citizens, and most certainly if they are in a direct service role; 3. voluminous clothes have the potential to be dangerous in the they can easy hide weapons of terrorism. I am very happy to see Muslems coming to Australia and having full freedom to ratite their religion in eace...but with the caveat that only if they also are prepared to compromise as far as is needed to live within such (reasonable) community norms.I would also hope that Muslim-dominated countries would note the example and give equivalent freedoms to other religions, but that is not a condition! Perhaps Marjorie Edwards should acquaint herself with some of the Anglo-Catholic religious orders of nuns who have not been 'impeded' by the Second Vatican Council and wear what we used to call 'full regimental dress'. Yes, the ageing Catholic nuns are indistinguishable from most middle aged or older ladies, but, by heaven, in mufti or full regimentals, they certainly have the runs on the board. It's a bit like the relaxation from calling someone 'Father'. It's the tenor of the times. I have the most enormous respect for the likes of Frank Brennan or Andrew Hamilton, who both have the runs on the board, but I believe that's the way most modern Jesuits like to be referred to. Convention is not religiosity. With Islamic women's gear, things are a wee bit more complicated. I believe the Prophet Muhammad prescribed that free adult Muslim women should cover everything except their face and hands. Some modern Muslims debate this and say that what he meant was that women should dress modestly. Ian Fraser's report of changes in Indonesia mirror Egypt. Sadly, in the latter country, you also had the 'acid throwers' who took unilateral action against any woman they considered dressed 'immodestly'. That action would be condemned by even the most conservative Muslim jurist (unless he was insane or an extremist or both). Working in an area with many Muslims (and in a hospital with many Muslim staff and patients, and with a fine Muslim chaplain colleague),my experience is very different to Dr Woodlock. Many Muslim women wear a veil ; others do not - practice varies even within families. However, the burqa is not uncommon in the Bankstown area and especially in the heart of our Muslim community, the rather unpleasant suburb of Lakemba - where I have encountered public promotion of the "coming Caliphate", and physical attacks on Christians and the Church. The burqa is not Islamic in origin of course ; I am told some 1st century Jewish women covered their faces. But it is a symbol of patriarchy, offensive and degrading to women, and associated especially with the fanatical regime that has taken control of Saudi Arabia, the home of the terrorists. For once, I applaud Pauline Hanson and deplore the way in which the Opposition gave a standing ovation to a Senator's sentimental and silly comments. Rachel, how long since you have been to Australia? I see the burqa every day in Melbourne. Are we not discriminated against when we are unable to see a person who can see us? Oh the blindness of us all. I normally keep away from the comments section of newspapers, particularly if the newspaper is owned by a certain US ex-pat, but the readers of Eureka Street are good eggs, so I thought I might respond to a couple of points made. Thank you John F, Brett, Edward, and Ian kindly for your appreciative remarks. Pam: I agree, no matter how a woman dresses and presents herself to the world, she is a text to be read by observers. Rosemary: I hope you don't feel I was nun-bashing. The habits of religious women have also, sadly, been the object of ridicule, which is the point I was trying to make in my opening paragraphs. Margorie: I can understand the reforms of Vatican II but I too love seeing nuns in their habits. It says that religion has a place in the public sphere, and is the 'uniform' hopefully associated with, as you say, 'selfless dedication to their Lord and Church' and others. Margaret: What a wonderful suggestion by Archbishop Hart. I think smiling and reaching out to people is exactly how we demonstrate our ability to rise above fear and prejudice and acknowledge the essential humanity of our fellow citizens. Jane: You're right about the "probably a prostitute" line. After I'd sent it off, I wished I'd written it differently. My prejudices (and age) surfacing there. However, although I didn't touch on it in the article, there are gender norms religiously prescribed for Muslim men it's just that they rarely get much attention. In the cultures where arranged marriages are normal, the men too accept chosen mates by their families. Furthermore, there are some Muslim men who veil their faces (eg. the Tuareg of the Sahara), and until recently, respectable Muslim male dress covered all the same parts of the body as women with the exception of the face. The religious difference being in what was considered compulsory for (free) people to cover in acts of worship. A good book on this is Fadwa El Guindi's _Veil: Modesty, Privacy and Resistence_. I'm not saying that women have the same level of rights and autonomy in many Muslim societies today, what I'm saying is that the religious interpretation of gender performance is fluid, contested, and influenced by culture. All Muslims have the right to interpret their faith. If that means face-veils for a small minority of women, then that is their understanding of the religion and should be respected so long as it does not actively harm anyone else. Eugene: Noone has a *right* to see somebody else's face, with the exception of some types of service delivery, for example interpreters for the deaf community, and in some situations, for example establishing identity in courts of law. As for how much of religious interpretation is voluntary, there is an element of cultural influence but among the Australian Muslim women I interviewed face-veiling was a freely-chosen act that in many cases contravened what their families wished. As for voluminous clothes being potentially dangerous--as far as I am aware, those blighted souls who engaged in acts of terror weren't wearing them at the time. I'm not sure how useful a ban would be, given that you can hide weapons in backpacks and prams too. I too would like to see genuine religious freedom in Muslim-majority countries. John F. and Mary: what you are seeing are niqabs, not burqas. @Rachel. Thank you for the photo of your lovely smiling face. "The quickest and shortest way to contribute to world "peace" is by smiling". "If you can smile and get a smile in return you're doing your "peace" ...a pun on the word "peace". "It is sunnah to smile to people........ Smiling to one another is a good deed". As you know. Does the chadri facilitate or prevent this good deed? A number of posters have asked whether covering the face (in particular the eyes) is a form of discrimination - should people be able to see those who can see them. Here's an interesting twist. I am legally blind and wear telescopes to magnify the fuzzy blur that is my world (due to a nystagmus - a brain issue which prevents the eyes focussing). The telescopes, though clunky and blocking my eyes from view, allow me to see a little (in a very small area). Obviously, however, it denies others eye-contact with me. Should I remove the telescopes (thereby stopping me from getting even a limited view of them - and perhaps picking up some few visual cues which might aid me in conversation) in order to grant others the right to see me? What about people who wear sunglasses? Are your suave Ray-Bans an infringement on my human rights? Where I live in Qld we see the burqa often. I have absolutely no objection to any form of dress or veiling; however, covering the face, often totally, is unacceptable. I spent a couple of days in Dubai last year. Many women were wearing burqas and it wasn't confronting at all. They were just people going about their daily routines. Some worked in banks and shops and we didn't have any issues talking to them. I must admit to a small smile at the sight of group of ladies in burqas taking a selfie in front of a landmark. But my point is that under the burqa they are just people like you and me living their lives. Burqas are less common in Australia so they stand out more in a crowd. But that is no reason to ban them. I am confronted more by other things in our society than by women wearing burqas. Paulines stunt was attention seeking behaviour, that is damaging. However, I am not a fan of the Burqa, as I see it as an infringement on a woman's freedom. I do see a few women wearing the Burqa where I live. I have Muslim friends, some wear head covering, some don't. I have no problem with any other veiling. I grew up with Nuns and wore a head cover myself at church. I don't agree with your holding Muslims up as 'better' than westerners, re the post cards. Muslims and non-Muslims have their strengths and weaknesses. Most Australians are aware Muslims have different dress, but this is about a confronting full face cover in a free country. It would be good to have a respectful discussion, but people here are free to wear what they want, unlike the countries the Burqa originated in. Growing more prevalent in Australia. Are burqa wearers equivalent to nuns? Nuns didn't cover their faces, don't 'marry' and devote their lives to service of the community. What is the burqa communicating - even from the Islamic faith perspective. It sends mixed messages, indeed the blindness of us all Mary. As a person who once used to wear a veil, I'd like to thank you for your very clear description of the ways Muslim women dress. I teach English to Refugees and Asylum Seekers who are mostly Muslim or Buddhist, men and women. We have great fun together each week. Mind you, I do get scared when I meet a woman in the street wearing a burga! I fail to understand why anyone would show lack of respect to these lovely people. Thank you for your great article. Quite a few commenters mention seeing burqas around and about. May I just clarify, what you are almost undoubtedly seeing is a woman wearing a niqab. This is a separate face-veil with a band that is tied around the forehead, dropping down to cover the face to the neck area with a slit opening leaving the eyes exposed, although some styles also have a sheer top layer that can be dropped down over the eyes. It is not the Afghan burqa. Just as a comment which might help somewhat. If you look at pictures of Italian women during the Renaissance, with everything covered except face and hands, that is almost exactly the same as traditional Moroccan women wear today. The Moroccan women are wearing traditional Muslim attire which is Sharia compliant. Covering your face, as with the Afghan/'Hanson' burqa goes beyond requirements. The same goes for some of the elaborate 'birdlike' face coverings women wear in the Gulf. I have known several intelligent, vivacious and feisty Pakistani ladies who dress modestly in saris and who do not cover their hair. One was of Pathan 'Pushtun' descent and would have been irate if anyone had suggested she was 'immoral' in dress or otherwise. I believe, traditionally, pre-Taliban, Afghan whores were often burqa clad. The only way you could tell them was by certain giveaway gestures. The Prophet Muhammad, I believe, was always adamant that modesty was not just in dress but also in attitude and behaviour. I remember an excellent 'Compass' program on the ABC about 'Date a Muslim'. It was a program run by a Muslim lady in Melbourne where non-Muslims met Muslim women for an hour in her cafe to discuss Islam. Some were traditionally dressed and prayed five times a day. Others weren't and didn't. It was extremely illuminating.